holiday launches are loaded with highlighters. At first I had planned to pick up the Becca X Jaclyn Hill trio of highlighter. Here's the thing though, I am on a don't-buy-things-you-already-have kick. I am checking myself before chucking things in my basket. And not only do I have Champagne Pop but I have two shade very close (if not near identical) to the other two shades in that palette. I did similar thing in MAC the other day with there holiday launches. I have been very good by turning away from things I essentially already own. Then I saw this baby; Bobbi Brown Highlighting Powder in Pink Glow. 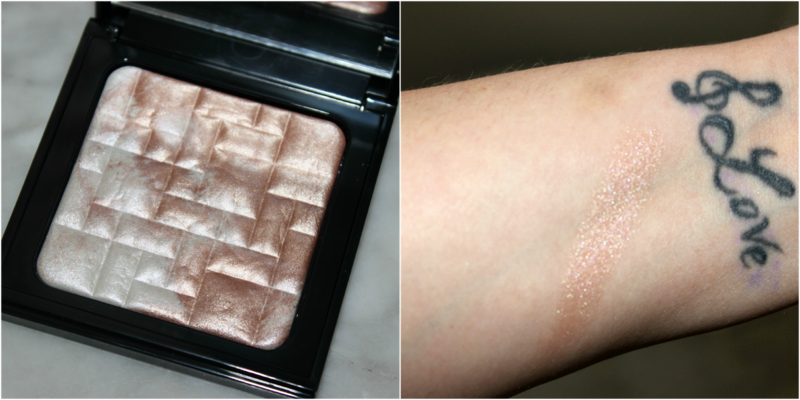 This is one of two limited edition highlighters from Bobbi Brown. The other shade is called Bronze Glow, which is descriptive enough to tell you what it looks like. I allowed myself to pick up this highlighter as I don't have a pearl/pink toned highlighter in my collection. I also tend to get even more fair in the winter and I love an icey highlight. I think this shade will suit anyone with alabaster-light-medium skin tones. On medium skin tones you may want to use this as an over the blush highlight rather than right on top of the cheek bones. Alabaster to light skin tones this is gorgeous worn either way. I knew Bobbi Brown would do a killer highlight as she always says she believes in highlighting not in contouring. I'm not sure I can get 100% on board with that thought process, but she does know how to make a girl glow. Bobbi is known for loving to make girls look the most natural and like themselves and celebrating the face they have by highlighting the good and understanding that there is no bad, which I can get behind 100%!! Over all this is a gorgeous highlighter for winter. I would not say it is quite as high impact as say the Becca highlighter, which is not a bad thing. It is somewhere between angel and natural. You can swirl the two tones together or use them favoring one or the other. The texture is lovely and the pigmentation is just right. It comes in that classic oh-so-Bobbi simple, chic, square, black gloss packaging with a mirror inside. I would say I am thrilled with this purchase and am glad to try another brand of highlighter that I haven't before. This has reminded me why I love Bobbi Brown so much! Have you tried much from Bobbi Brown? What is your favorite? Tell me in the comments. If you want to see this product in action be sure to see Friday's post which will be a Makeup Look for Statement Glasses Tutorial.